Q. How will the Globally Harmonized System (GHS) affect my HazCom Standard communications? Q. I’ve heard that OSHA is about to finalize a new Hazard Communication Standard that will change everything we’re currently doing under the standard. Is that true? In today’s Federal Register (76 FR 36414), the Occupational Safety and Health Administration proposed a set of rule changes to the Occupational Injury and Illness Recording and Reporting requirements. Question of the Week: When Do I have to Update My Material Safety Data Sheets? Q. 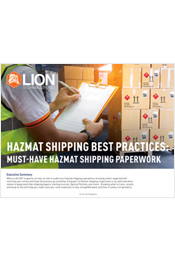 Under the Hazard Communication Standard (29 CFR 1910.1200), the Occupational Safety and Health Administration (OSHA) requires manufacturers and importers to obtain or develop material safety data sheets (MSDS) for each hazardous chemical they produce or import. Manufacturers and importers must provide these MSDS to distributors and employers with their initial shipment, and with the first shipment after the MSDS are updated. How often does OSHA require manufacturer/importers to update their MSDS?